The nicer weather is headed our way and that means it is time to start thinking about repairing asphalt cracks and your lot’s other essential asphalt repairs. Winter is harsh on your pavement for many reasons, and because of this, winter damages are very likely. 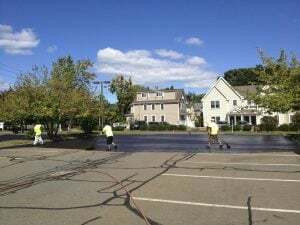 Spring asphalt repair is so important because asphalt damages left untreated can result in complete deterioration of your asphalt surface and its base. 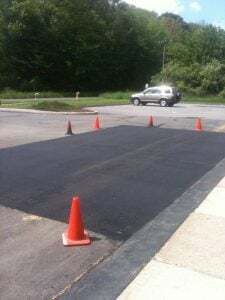 Depending on the severity of the winter season, and other factors, your spring asphalt repair plan may consist of small regular maintenance items, or more severe emergency repairs. Repairing asphalt cracks is one of the most (if not the most) important spring asphalt repair item on your list. Why? Because cracked asphalt can lead to structural deterioration. Cracks in asphalt allows for water to enter into the pavement structure. Water breaks down asphalt leading to larger cracks. Larger cracks can allow for water to reach the base. Once water reaches the base of your asphalt, its structural integrity will be compromised. At this point, repairs may not be enough. How Do I Repair Asphalt Cracks? 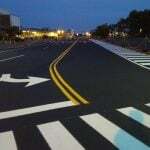 Crack Filling – Crack filling is the asphalt repair method used to repair asphalt cracks. By sealing cracks with hot rubberized crack filler, you are preventing water from seeping any further into the pavement. Applying asphalt sealer on top of the rubberized crack filler is the most effective and ideal repair method for cracks in asphalt. 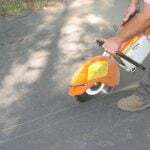 Pothole Patching – If your cracked asphalt has progressed to a pothole, you will need pothole patching. Over winter you may have patched your pothole with cold mix asphalt, but it’s important to realize that this is only a temporary fix and spring is the time to implement your more permanent solution. Saw Cut & Patch – This pothole patching method involves sawing out areas of deterioration and filling them again with hot asphalt mix. Expect to pay on average about $4-$12 per square foot for saw-cut-and-patch pothole repair. Milling & Patching – The milling process involves grinding out the surface of your asphalt to the desired depth. A new layer of asphalt mix will then be installed on top of the affected area to complete the repair. Curb Repair – You will also need to account for curb repair in spring since plows have likely done some damage to them. Expect to pay on average $8-$18 per foot of curb repair. You know the saying April showers bring may flowers right? Well, with much expected rain right around the corner, repairing asphalt cracks now is so important to avoid larger damages associated with water penetration of your asphalt structure’s base. 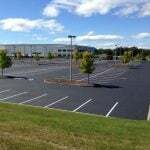 Spring is a very busy season for asphalt paving companies, so planning ahead for spring asphalt repair is key. As a property manager you should be budgeting and planning for spring repairs yearly. Although winter was not so harsh this year, due to much severely cold weather, the freeze-thaw cycle was in full effect and your asphalt pavement likely has seen some damages in need of repair. Now is the time to begin thinking about repairing asphalt cracks. 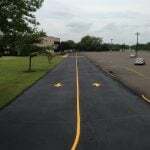 Contact EastCoat Pavement today for your free consultation and make sure you parking lot is ready for warmer weather!